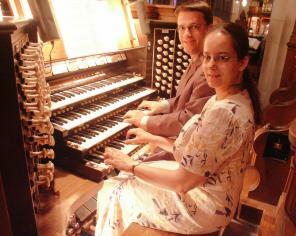 is actually called one of the leading european organ duos. 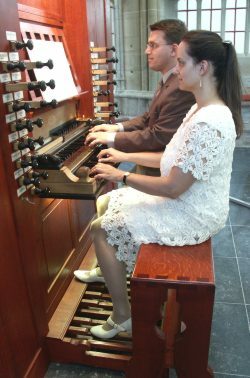 The two virtuosos have played numerous concerts all over Germany, in a lot of European countries, in Russia and in major cities in USA (New York, Chicago, Philadelphia, San Antonio, Durham) in most cases with distinctive programs and rare compositions for organ. 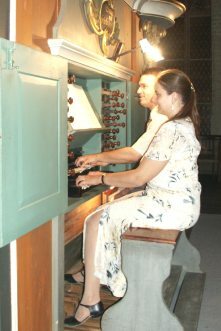 A CD with music for organ duet (recorded at 10 organs dating back to the 18th, 19th and 20th centuries) was published in the summer of 2002. 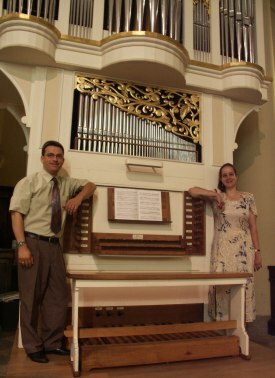 In 2007 they released their 4th CD with music for organ duet. With this program they also produced their first 4hand DVD video. 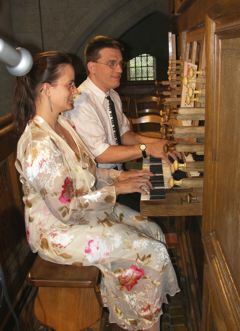 The Duo is specialized in organ music for two players at one organ. 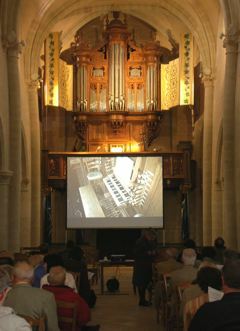 Their usually well attended concerts show the variety of organ music with the possibility for the audience to watch the organists (video-projection of the organ console). 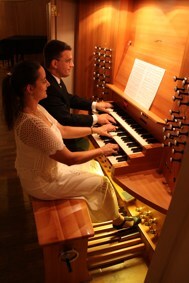 If you would like to get the organ duo for a concert at your church, just get in contact with Iris and Carsten Lenz. You may also receive an info-brochure and a Demo-CD (including audio tracks and a video sequence). 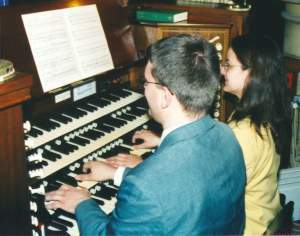 Born in 1969, studied church music (organ and choir directing) in Frankfurt/Main (organ with Dagmar Lübking and Tomasz Adam Nowak) and attended master classes for organ, notably under the direction of Andrea Marcon, Miguel Bennassar, Eckhard Kuper, Christiane Michel-Osterthun and Renate Zimmermann. Kirche in Wiesbaden-Biebrich from October 1996 to March 2002. Several CD´s with music for adults and childrens' choirs as well as organ music were recorded during this period. 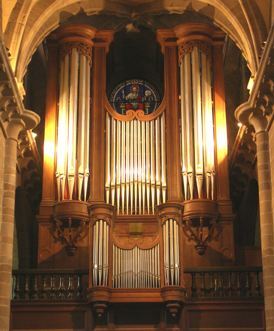 An intensive study of the Hesse-Nassau organ music of the 19th century was followed by the publishing of the book entitled “The change of the organ disposition with Daniel and Gustav Rassmann against the background of the Hesse-Nassau organ literature”. 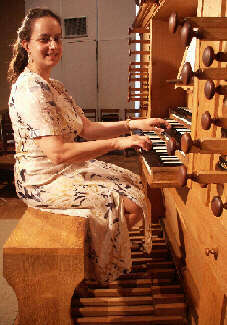 She is presently a choir director and organist in the Rhine-Main area. 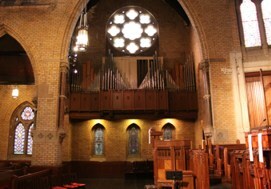 Born in 1970, received his first tuition on the organ at the age of 12. 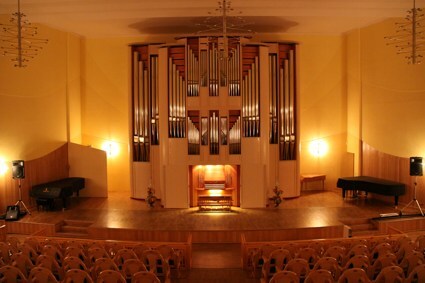 He studied church music in Frankfurt/Main (organ with Dagmar Lübking) and he received his concert artist diploma in organ playing at the Wiesbaden Music Academy (studied organ with Elisabeth Maranca). He also attended master classes for organ, notably under the direction of Jon Laukvik, Andrea Marcon, Miguel Bennassar, Eckhart Kuper, Christiane Michel-Osterthun and Renate Zimmermann. 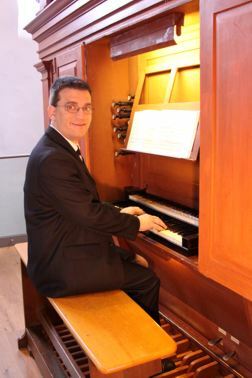 After holding positions as organist at serveral churches in Wiesbaden, he became deanery church musician (director of music and organist, 27 churches) in Ingelheim am Rhein. At this location he founded the Georg-Philipp-Telemann Choir and the childrens' choir of the Ingelheim deanery which has advanced in the meantime to becoming one of the largest choirs in the region. He has madeover 20 LP and CD recordings in recent years and has also published musical scores . In addition, he also performed as an organist in numerous radio and TV productions, and has written several compositions of his own for organ (including compositions for four hands); some of his choral arrangements were published in a collection of choral preludes for the new hymnal (Strube Verlag). In addition to a large number of appearances as a organ soloist, he has also performed major concerts for organ with orchestra (Händel, Haydn, Poulenc, Rheinberger g-minor, Gárdonyi). The virtuoso finger play of Iris and Carsten Lenz in a live performance (projected onto the screen) was marvellous . It was indeed most exciting to observe the implementation of precision on a high artistic level.… a most refreshing performance where four hands and four feet played into the hearts of the listeners. 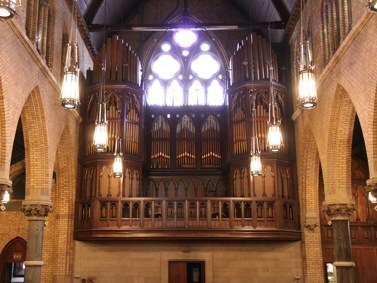 This is the way to become a lover of organ music … double original…The performance of the feet was also displayed on a large screen in the choir. 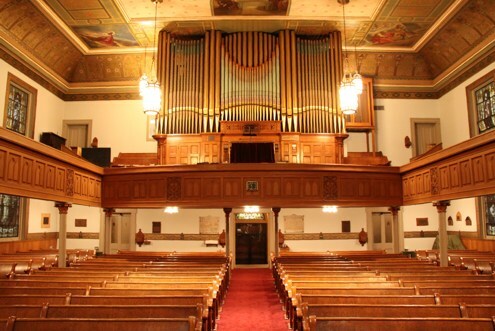 The participation of the audience was fascinating in two ways: the otherwise secluded play on the organ was enjoyable to all, performed particularly with four hands and four feet. 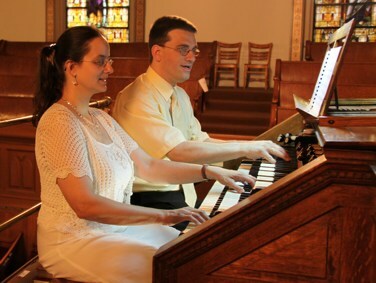 The enthusiastic audience was granted the opportunity of admiring and enjoying the virtuosity, the intelligence of the registration and the precision of the organists Mr. and Mrs. Lenz. 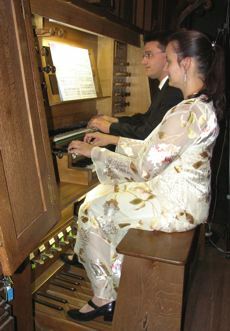 On Wednesday evening in the reformed church in Gossau, a fascinating and a unique organ concert took place with Iris and Carsten Lenz. The two young Germans are a dream couple not only in life but also on the instrument. They perform together, with four hands and four feet, throughout all the centuries of music history. 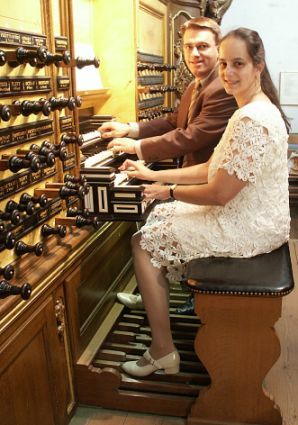 It was a real pleasure to watch Mr. and Mrs. Lenz playing on the organ with four hands and four feet. 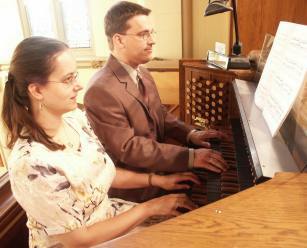 On Wednesday evening, they performed before a large audience in the reformed church in Gossau. Their hands sometimes played on the same manuals, sometimes on different ones; then there was performance in parallel, followed by an intermeshing of all four hands. During a contemporary ragtime “Max Cat Rag” by Robin Dinda they performed a passage written for four feet only, a composition demanding full physical application from both musicians. 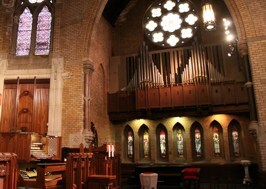 The couple had a video camera installed which transmitted the musical performance from up above in the gallery to a large screen in front of the pulpit. 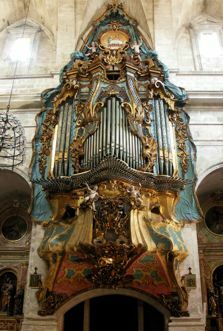 In that way, the large audience in the church could follow every single detail as the musicians´ fingers performed on the keys. The 33-year old Carsten Lenz and his 34-year old wife Iris demonstrated their indepth scope of style which covered an extensive range of music of summer-joyful works including the baroque and romantic periods as well as contemporary compositions. 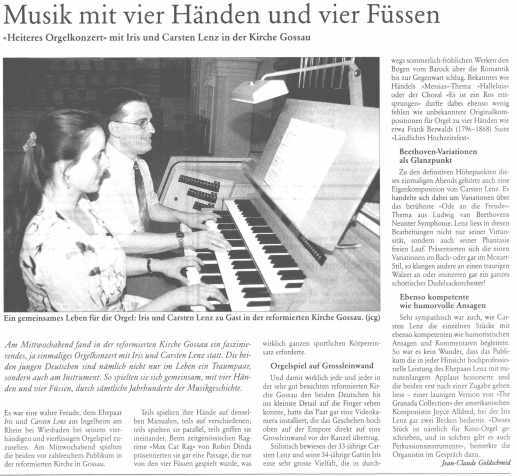 Of course, well-known works such as Handel´s “Messias”-theme “Hallelujah” or the choral “Nun danket alle Gott” (Now Thank We All Our God), as well as the unknown original composition for organ for four hands such as Franz Berwald´s “Rural Wedding Feast” were not omitted in the program. Carsten Lenz' performance of one of his own compositions was definitely one of the highlights of this unique evening of music. This composition was variations on the famous theme “Song Of Joy” from Beethoven´s Ninth Symphony. With these arrangements, Lenz placed no restrictions on his virtuosity and fantasy. Some variations were in the Bach and Mozart style while others sounded like a waltz or even imitated a full bagpipe orchestra. It was also very pleasant to listen to Carsten Lenz as he accompanied the individual pieces of music with competent and humorous statements and comments. No wonder that the audience thanked Mr. and Mrs. Lenz for their highly allround professional performance with a prolonged applause while adamantly insisting on an encore a moody version of “The Granada Connection” by the female English composer Joyce Alldred where Iris Lenz also used two cymbals for the performance. The organist explained later: “this piece of music was actually written for cinema organs and percussion instruments are included in such”.